Nicole Kidman put in a star performance as Rosalind Franklin the scientist who developed the world famous x-ray diffraction photograph, the pivotal piece of information that helped reveal the structure of DNA. Franklin was undoubtedly a pioneer in her field but never received the accolade of having her name alongside Crick, Watson and Wilkins, who received the Nobel Prize for Medicine in 1962. In fact Rosalind didn’t even live to see the sixties, having passed away in 1958 from cancer which she contracted possibly as a result of her x-ray diffraction work. As I took my seat to watch a performance on the evening of Saturday 26th September I didn’t quite know what to expect, although I knew the basics of the story and the photograph itself very well. Nicole Kidman was utterly convincing as the brilliant, driven, fastidious and downright prickly Dr Rosalind Franklin, giving the character the necessary gravitas and emotional brittleness to drive the story which begins in France. Franklin is saying au revoir to her French colleagues, as she is about to take up a prestigious post with Dr Maurice Wilkins at Kings College London working on DNA. On arrival at the subterranean laboratory of Kings College the conflict between Wilkins and Franklin begins virtually immediately. Wilkins bumbling English ways where his efforts to be nice are totally shredded by the abrasive Franklin, eventually results in them not being on speaking terms. Franklin as a Jewish woman may have felt it necessary to fight against everything to be taken even remotely seriously, especially working in the male dominated Christian created King’s College. After all she was living in post-war 1950s England where women stayed at home, had children and remained subservient to their husbands. So Franklin in the play works longer hours than her colleagues, has literally no life other than her work, and has an even stiffer upper lip than her English male counterparts. Unsurprisingly she is not the easiest person to get along with, and any genuine concern shown for her well-being is brushed aside. The scene where her PhD student is vainly trying to encourage care whilst maintaining the x-ray diffraction equipment is particularly poignant and my alarm here was palpable. For all Rosalind’s care and cautiousness at interpreting results, the play suggests impatience at delays, a consequence which could result in potentially deadly mistakes being made. Crick and Watson the other main protagonists of the story are in a way the twin equivalent of Wilkins and Franklin. Crick doesn’t quite have the awkward bumbling manner of Wilkins but he heads his group at Cambridge as Wilkins does at Kings. Crick struck me as a facilitator who let or made things happen, whilst his post-doc student Watson seemed the driving force behind the groups work. James Watson was the same and yet opposite to Rosalind Franklin. Both scientists were brilliant at their work, driven by an insatiable inner force, with a tunnel-vision approach in trying to get their goal. They differed in that Franklin appeared to be cautious, had scant interest in other peoples “misguided theory” publications and worked by choice, virtually alone and shared none of her results. Watson seemed almost reckless at times, made it his mission to know what anyone was doing in the DNA field, and hoovered up bits of information whenever he could, to use at a later date. Watson seemed to happily bounce ideas off his supervisor Crick, who in turn went along with theories in more than one attempt to model the DNA structure. The actor playing Watson showed remarkable guile and cunning whilst appearing to chat amiably about work in Maurice Wilkins office. In turn Wilkins naivety came through when he innocently showed Watson the best x-ray photograph to date. The beginnings of unravelling the DNA structure clearly took place at that moment. During the play an illuminated square on the stage floor was used to refer to the DNA structural model, the audience just had to use their imagination. 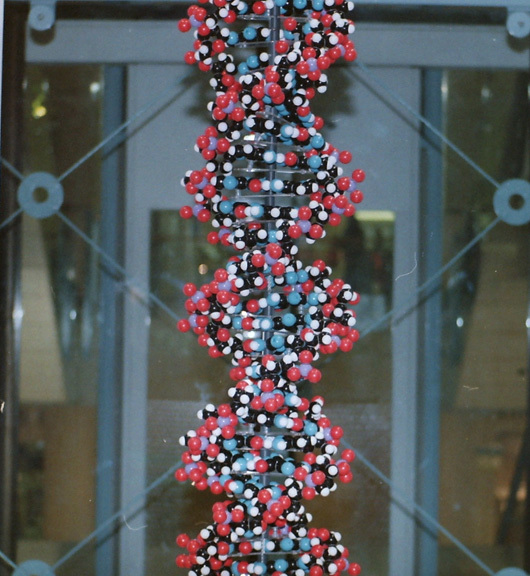 But I witnessed and photographed the Guinness World Record certified DNA model construction by Keele University, so it was easy for me. Anna Ziegler’s writing throughout was exceptional with a touch of whimsy sprinkled occasionally in the dialogue, a case of “what might have been” scenarios. At these points Nicole Kidman was able to give her character more light and shade creating a more rounded and likeable persona. A scene on yearning is beautifully almost poetically phrased, where Rosalind for a moment, yields to an inner set of emotions that are perpetually kept in check. You could see Kidman’s face illuminate and the character for a split second bloom, before withering again. The effect is devastating particularly as the scene is used as a vehicle to introduce Franklin’s cancer diagnosis. At the end of the play there is juxtaposition between a character dying in Shakespeare’s A Winter’s Tale and hope staying alive. Rosalind and Maurice Wilkins are discussing a Laurence Olivier film and neither of them can remember the actress who played alongside him. Prophetically Franklin says “She just never put herself forward” which was also Rosalind’s epitaph. I was biting my lip at that point trying very hard not to cry, and a visibly moved Nicole Kidman could be seen brushing away tears as she accepted the audience’s applause. I got the impression that Rosalind Franklin was diagnosed with cancer and succumbed to it quite quickly, whilst still part of Maurice Wilkins group in the early fifties. However this is where a little artistic licence has been used to keep the integrity of the play within the realms of Kings College, as the story gets a little complicated otherwise. Rosalind Franklin left Kings College and relocated to Birkbeck in March 1953 where she worked on the structure of viruses and RNA. The stipulation of her move prevented Franklin from continuing work in the DNA structure field (either by contract design or personal choice). It was whilst at Birkbeck in the autumn of 1956 that Rosalind discovered she had ovarian cancer, and she passed away on April 16th 1958 aged just 37. Rosalind Franklin appears to have been the ultimate contradiction, both a woman ahead of her time but a product of her time. She refused to play the politics game in the lab viewing herself as an equal to Wilkins, not an assistant of his within the group. Whilst most women remained in the home, she worked in a male dominated field and was as good if not better than her counterparts, a true pioneer for working women of the future. Yet having been raised in an era where women were seen and not heard, Rosalind never ever put herself forward. Her almost pathological need to be absolutely sure about something before considering putting ideas into the public domain, and her reluctance to share results undoubtedly stems from her upbringing. That inability to take the leap of faith that science sometimes demands was sadly Franklin’s Achilles heel. This play provides a unique glimpse into a pivotal moment in scientific history, as told through the story of Rosalind Franklin, a woman who has never received the accolades she truly deserved. 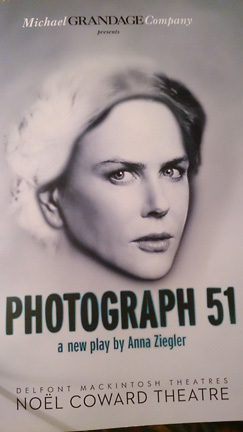 Photograph 51 limited season until 21st November 2015.